China’s Xiaomi has entered the laptop market with new, lightweight notebooks that run Microsoft’s Windows 10. The company, which has been getting into new markets including air-purifiers and drones, introduced on Wednesday its Mi Notebook Air, at prices ranging from RMB 3499, or around $524, for the 12.5-inch model with the larger, flagship model at RMB 4,999, or about $749. Xiaomi is entering the Chinese laptop market at a time when the market for consumer laptops is shrinking. The Chinese market for consumer notebooks is expected to contract by 10.4 percent this year, according to Bryan Ma, IDC’s vice president for devices research. The announcement of the laptops came at an event where Xiaomi also rolled out a new smartphone, the Redmi Pro, a dual rear camera OLED phone. Xiaomi badly needs a new flagship phone as it has seen market share decline from 14.4 percent in the fourth quarter of 2015 to 9 percent in the first quarter of this year, according to data from IDC. The new notebooks alone aren’t meant to offset phone sales, but are more of complementary products to fill out the company’s broader portfolio of electronics around the home, Ma said. Xiaomi has diversified into a number of products under a new “Mi Ecosystem” sub-brand, in tandem with local manufacturers. The notebook is meant to be part of the Mi Ecosystem and will likely be targeted at the same young professional Xiaomi fans in China that they also target with their rice cooker, TVs and other products, Ma said. The key features of the 13.3-inch Mi Notebook Air are a Nvidia GeForce 940MX dedicated graphics card, Intel Core i5 processor, 256GB PCIe SSD with expandable SATA SSD slot, 8GB DDR4 RAM and 802.11ac Wi-Fi. It is said to last 9.5 hours on a single charge, charges 50 percent in 30 minutes, and weighs 1.28 kilogram and measures 309.6 x 210.9 x 14.8 millimeters. It features Type-C USB for charging, and two USB 3.0 ports and a single HDMI interface. 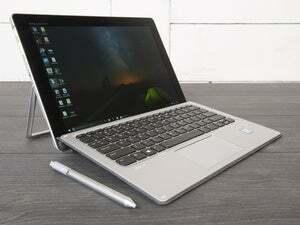 The 12.5-inch version weighs 1.07 kilograms and has battery life of 11.5 hours on a single charge. It runs the Intel Core m3 processor with integrated graphics and has 4GB of RAM and 128GB expandable SSD. The devices come in gold and silver colors. The products go on sale in China next week, with no plans to sell it outside the country for now, according to a spokeswoman. The company has had its sights on the U.S. market for some time, but is apparently wary of patent infringement lawsuits, a standard strategy for established players to keep rivals out of the lucrative U.S. market. Microsoft recently agreed to transfer patents to Xiaomi. The cross-licensing and patent transfer deal also involved the bundling of Microsoft Office and Skype on Xiaomi’s Android smartphones and tablets. The notebooks are China-focused for now given how the Mi Ecosystem has so far been largely contained in the country, according to Ma. “Besides, they’d likely take a lot of heat from overseas users for making the product seem so Apple-like, especially given the many accusations thrown their way already about their phones,” he added.